5-6: Significantly clearer path to victory for one person. The Contender Series alum Sodiq Yusuff will be looking to make it 2-0 in the UFC after stopping Suman Mokhtarian in the first round last December. To do so, he will need to defeat a man with only two losses, both coming to very high level opponents: current #1 bantamweight contender Marlon Moraes and rising featherweight phenom Zabit Magomedsharipov. If Yusuff wants to hand Moraes his third loss, he should look to use his self-proclaimed “blacksplosiveness” very well on the counter, which is when Yusuff can be dangerous and attack in spurts. Sodiq Yusuff appears to be an MMA version of a basketball “streak shooter.” He waits for open opportunities to present themselves, and when he they do, he scores shots in flurries: a streak fighter, if you will. Yusuff’s style can deceive many into believing he is an aggressive fighter, but I’m not sure that’s accurate. He is someone who seems to be comfortable allowing his opponent dictate the pace. And if they feel froggy and begin to get aggressive, then, and only then, Yusuff sees his opponent’s aggression and raises it two or three levels. Yusuff has composure beyond his years and is able to remain patient, throw in some leg kicks while he waits for power shots to open up, and he appears to have decent grappling. For Moraes, the biggest thing will be not to let Yusuff overwhelm him in his counters, and pace yourself. One thing about Moraes is that he has slowed down in the past, and if that happens here, Yusuff could definitely take the decision. I’m going to put faith in the fight experience of Moraes and believe that his cardio will hold up in this one. The fact that Moraes has only lost to Marlon Moraes and Zabit Magomedsharipov gives me small confidence, not only because that’s all he has lost to, but because those opponents represent the larger fight that Moraes has had much more quality fight experience than Yusuff has had thus far. I also believe Moraes has a bit more striking versatility, as the better kicker of the two, and that every strike could matter in what I expect to be a close fight. This is an unpredictable fight on a few levels, but there is one thing I can say with confidence: both fighters have a crystal clear path to victory. For Kennedy Nzechukwu, he is going to have to keep Craig on the outside, and with his 83” reach, this 6’5″ Nigerian certainly has the genetics to do just that. Paul Craig is no shorty himself, standing only one inch shorter than Nzechukwu at 6’4”, however his reach is seven inches shorter. In order to pick Nzechukwu, it is almost as if you have to decide to disrespect Paul Craig. And in saying that, I do not intend to disrespect Nzechukwu in Craig’s place, but the reality is, six fights into his MMA career, no prior combat experience, still only being in his mid-20s (26), and most importantly, based on his technique up to this point, Nzechukwu appears to be very, very green. Because of his genetics, he has a pretty wide ceiling, especially with the right training and coaching, and I’m sure he will have improved prior to each of his bouts, including this one, but I do not believe he will be improved enough for Paul Craig. Paul Craig’s path to victory is to rein in on his ego and adrenaline, collect himself, use your experience edge, and, above all, get the fight to the mat where Craig will have the clear advantage should he be able to keep Nzechukwu down. I believe Craig will be able to keep Nzechukwu down, at least long enough to use his underrated submission game to get the victory. Another thing about Nzechukwu is that in addition to being green, his level of competition has been nowhere even remotely near UFC caliber yet. With that in mind, against non-UFC opponents, that would make this a 10-0 fighter with top-notch grappling against a 6-0 fighter who still has a long way to go in all areas. Craig should take this fight with the right game plan. Two fan favorites will collide in this bout between two ranked strawweights, Karolina Kowalkiewicz (#6) and Michelle Waterson (#9). These are two technical strikers with different backgrounds, with Waterson having a base in karate and Kowalkiewicz having more of a kickboxing/Muay Thai style of fighting. Of the two, Michelle Waterson would be the one who is more likely to look to take the fight to the mat, but I expect Kowalkiewicz’s takedown defense to hold up and particularly avoid Waterson’s patented head-and-arm takedown. I envision this fight going to the judges and being scored to the better point fighter. Karolina Kowalkiewicz is among the best point fighters in the division, while Waterson, though also capable of outpointing most women at 115 on any given night, she is at her best when she is fighting very aggressively and seeking a finish. Waterson is currently on a two-fight winning streak, both by decision, but I do believe that this time, the decision will not go her way. Ultimately, Karolina Kowalkiewicz has only lost to three of the toughest women to beat in the division, longtime champion Joanna Jędrzejczyk, Claudia Gadelha when she was still performing at peak levels, and most recently, Jessica Andrade. Meanwhile, Waterson has been bested six times. Waterson takes a lot of risks, which can lose her fights but it can also lose her rounds. I believe Kowalkiewicz’s composure will hold up should Waterson grow wild, and that her striking skills will edge Waterson out if she remains patient. Josh Emmett makes his Octagon return for the first time since February of last year when he takes on Michael Johnson who continues to ease into new life in the featherweight division. Much like the previous bout, this fight should remain standing throughout, with the better striker getting the W.
Josh Emmett has the speed advantage with his movement, but Johnson has the speed advantage with his hands. I also believe that Johnson has a power advantage on the feet. One advantage Emmett does have in the standup department is that he is a superior volume striker. When factored in with his movement, it is not difficult to envision Emmett outscoring Johnson for a decision. Michael Johnson is able to find success in his offense either going forward or fighting off of his backfoot, so Emmett’s movement shouldn’t be anything Johnson hasn’t seen before or that he would not be prepared to solve. Michael Johnson has not earned a finish at featherweight yet, but that does not mean he has lost his power or even that it has diminished. Sure, Johnson having more power at lightweight would be logical as he would be larger, more energetic due to a lighter weight cut, which is something we have seen lately from other fighters, but do not be too quick to call Johnson a KO-artist of yesterday. He has fought some of the toughest, most durable opponents in the division, including Darren Elkins, Artem Lobov, and Andre Fili, whose only KO loss came by a flying head kick from Yair Rodriguez. Johnson can still crack, and we saw glimpses of that in the Elkins fight, the Lobov fight, and even his lightweight farewell fight against Justin Gaethje. The last time Emmett competed against a man who can crack was his last time in competition, and he got knocked unconscious by Jeremy Stephens, a fight which, to this day, Emmett has still not fully recovered from, which is another concern. I’m expecting Michael Johnson to either get the finish or land the more meaningful strikes to win a close decision. This middleweight scrap may be the closest fight pre-card to predict. What I do expect is a smart fight between two gritty men, both looking to impose their will on the other but in conflicting ways. For David Branch, I’m looking for the former WSOF fighter to try to grind Hermansson out on the mat. But after knocking out a knock-out artist in Thiago Santos, David Branch reminded fans that this veteran still has a few surprises for the audience. As for Hermansson, I expect him to come out as the more aggressive fighter and also the fighter with more heart. David Branch could very well outfight Jack Hermansson throughout the entire bout, but one thing we have learned from Jack Hermansson, specifically from his Thales Leites bout from last year, is that he will never give up. Jack Hermansson knows his way around a striking manual, as the Swede holds 11 victories by TKO. Hermansson also owns four submissions, but should he go down to the mat, I expect him to use his will and determination to struggle back to his feet, where he should hold the advantage. David Branch will have the grappling advantage, but Hermansson will have the intangibles on his side as well as a striking advantage. I can even see Hermansson pulling of a surprise submission victory if the opportunity presents itself. Therefore, Hermansson has more paths to victories here and his never-say-die attitude makes it hard to count him out during a fight, let alone prior to one. Our main event will feature a fight that has the makings to be an instant classic. It will feature sensational striking artist Edson Barboza looking to win two straight against a certified savage in Justin Gaethje, who will be looking to do the same. In Justin Gaethje’s last outing, he knocked out James Vick in the very first round, pulling off the slight upset and showing that he doesn’t always need to fight a war of attrition in order to win a battle. Such a result is one path of victory for Gaethje: get off to a fast start and land a knockout blow early in the fight, where his power will be the highest. One area of Justin Gaethje’s game that we are still yet to see is his Division I wresting. As much as Justin Gaethje’s fighting style is arguably the most popular in the entire UFC right now, even some of his fans cannot help but express concern for what he is putting his body through in the brutal battles he has endured and have called for him to implement a higher fight IQ moving forward, most specifically using his wrestling credentials more frequently, even if just to mix up his offense a bit. If there were ever a time to take that advice and use his wrestling, this is the fight to do it. Sure, doing so would disappoint many fans who are eager to watch what could be the most action-packed fight of all of Gaethje’s classics, but Gaehje needs to put his career and health ahead of appeasing the masses and understand that Edson Barboza was recently dominated by two wrestlers: Khabib Nurmagomedov and Kevin Lee. Gaethje does not need to make wrestling the focal point of his game plan, but he should at least mix in some takedowns to win rounds and save himself a few brain cells along the way. But up until now, because of how stubborn Justin Gaethje has continued to fight, I have no choice but to side with the data and anticipate him to do the same thing once again. But this time, he will be doing it against a faster, more dynamic, sharper striker, which includes kicking. 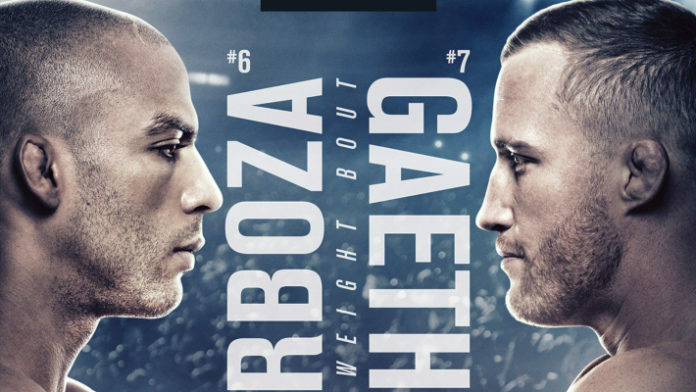 Barboza will leg kick even harder than the leg-kicking specialist Gaethje, and then proceed to kick Gaethje’s body and head, including and especially off the backfoot if Gaethje continues to press forward with abandon. Gaethje’s plodding forward movement just has flush Barboza wheel kick written all over it. Some may rest their case on Gaethje’s toughness, but after watching how much Barboza was able to endure from Tony Ferguson, Khabib Nurmagomedov, and Kevin Lee, I do no think Barboza will ever stop fighting, and when he does, his fighting will be more technical, crisper, and Gaethje could take a nauseating amount of punishment. Because of Barboza’s ability to counter overly aggressive strikers as well as fight well backing up when pressured and simply being the better striker, Barboza should be able to win what will possibly be a fight for the ages. Be sure to stick with MMANews.com for live coverage of UFC Philadelphia, including results, highlights, and more!